This photograph was taken in the early 1900s and is an picture that the team have never seen before. 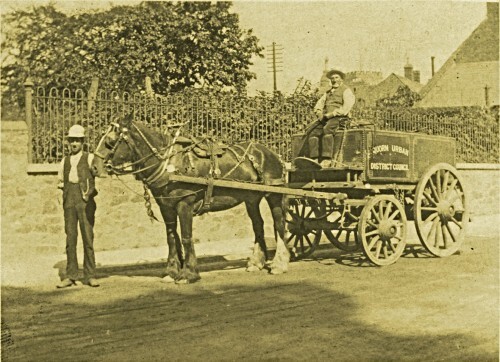 It shows a Quorn Urban District Council horse and cart standing on High Street in front of the Rawlins end of ‘The Banks’. The photographer must have been standing almost outside what is now the Quorndon Fox pub. Quorn Urban District Council was created by the 1894 Local Government Act and disbanded in 1936 when it was taken over by Quorndon Parish Council and Barrow Rural District Council. Can anyone recognise the two men in the picture? Missing information: Can you identify either of the two men?